A supermassive black hole inside a tiny galaxy is challenging scientists' ideas about what happens when two galaxies become one. 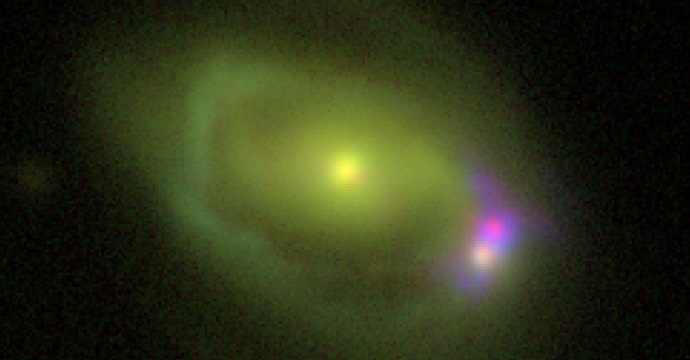 Was 49 is the name of a system consisting of a large disk galaxy, referred to as Was 49a, merging with a much smaller "dwarf" galaxy called Was 49b. The dwarf galaxy rotates within the larger galaxy's disk, about 26,000 light-years from its center. Thanks to NASA's Nuclear Spectroscopic Telescope Array (NuSTAR) mission, scientists have discovered that the dwarf galaxy is so luminous in high-energy X-rays, it must host a supermassive black hole much larger and more powerful than expected.